By the late 1940's Bradshaw Crandell had turned over the reigns of producing the covers at Cosmopolitan to Jon Whitcomb. 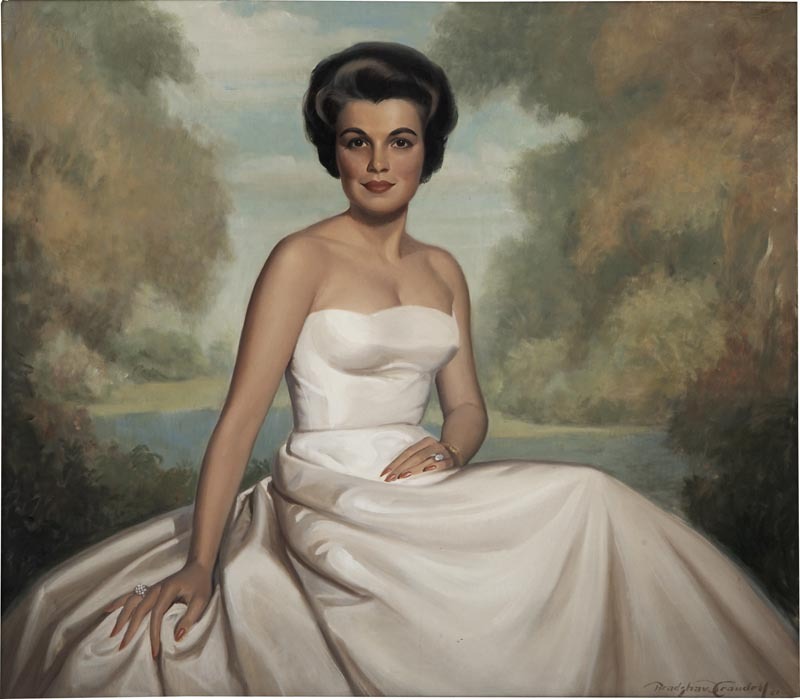 Crandell himself had been Harrison Fisher's beneficiary in the 1930's. However the decade of the 1950's brought a new direction for Crandell. Throughout his career, Crandell had used pastel as his primary media for it's spontaneity and managing deadlines. He was ready for a change. He had taught himself to paint with oils, and with his unwavering dedication was producing work that would rival his magnificent pastel illustrations. Crandell was now in his preferred element. Although he achieved immense success as a cover artist, it was only after he left the commercial field and began to concentrate on painting portraits, that he truly felt happy. He loved working with people directly. Crandell's models sat for him. He would work from photo reference as a backup to the original sitting. He instinctively knew that was the only way to make a great picture. Crandell never analyzed a subject to bring out the true nature of the sitter. He painted what he saw, where the real person came to life. Choosing to only see the good in people, he would capture his subjects at their best. In 1954, Crandell made Madison, Connecticut his permanent residence. It had been his summer home and retreat for many years. He would maintain the East 52nd Street studio in New York for another eleven years. It was during this time that his status as a renowned portrait artist was established. Now instead of movie stars, his commissions were numerous Governors; heads of state; and society women. His career had come full circle. He was now fulfilled, producing art in the tradition of the masters he had long admired. Throughout his life and career, Crandell had been at the top of his field. He received many of the accolades due a man and artist of his caliber (among other things you could walk into The 21 Club, or The Stork Club and order concoctions entitled "Red Head" and "Bachelor Girl", inspired by Crandell's work). Along with many associations, he was an active member of The Society of Illustrators, and was recently elected to their Hall of Fame. 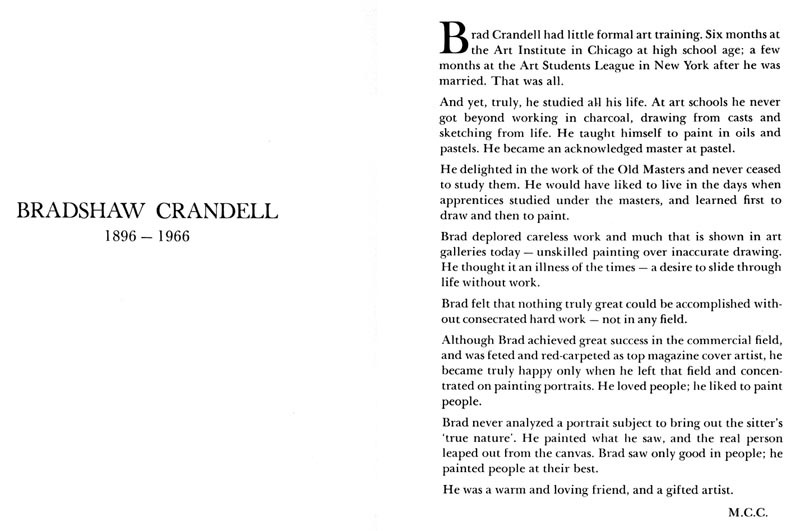 Crandell was very active within the "Society", contributing art, and goodwill throughout the membership. He was also a member of the Artists and Writers Association; and the Dutch Treat Club. 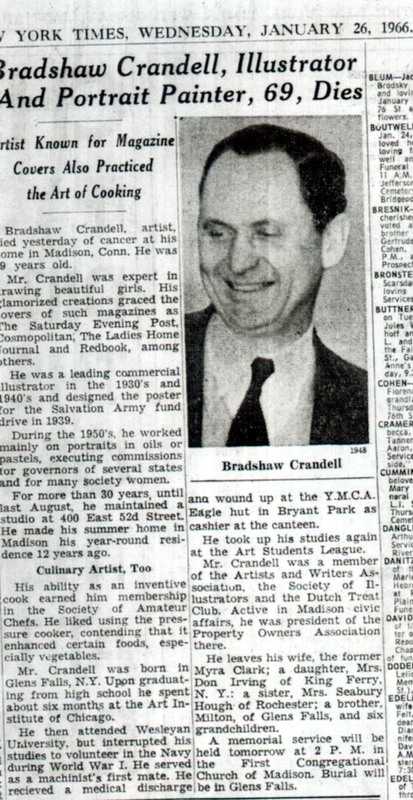 Crandell was also an excellent and skilled chef. He was a member of the American Society of Amateur Chefs; as well as serving as President of the Property Owners Association in his hometown of Madison, Connecticut. 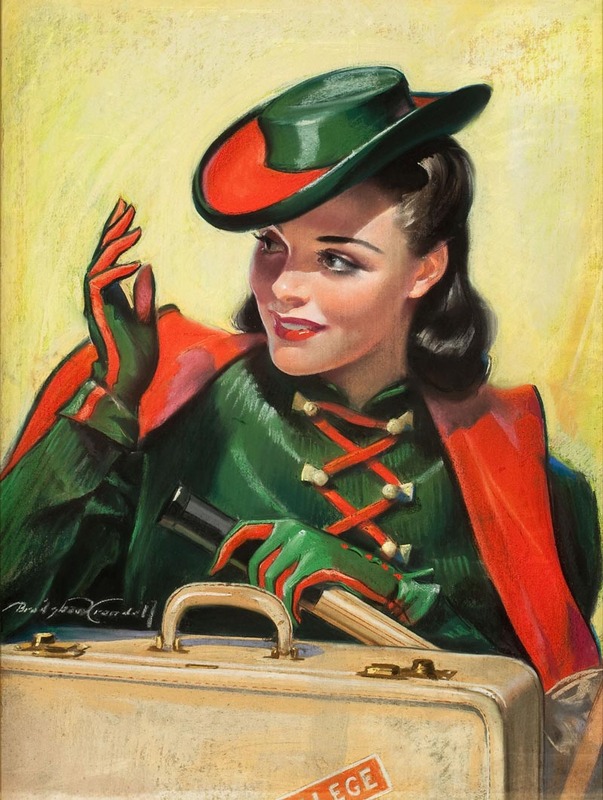 Sadly, by 1965 Bradshaw Crandell had contracted cancer. Reviewing letters written by him at this time, one finds no remorse or bitterness as a result of his condition. There is merely grateful appreciation for the innumerable admirers of his work. He passed away in the comfort of his home January 25, 1966 at the age of 69. Today the measure of beauty has a different ideal in life and imagery. What likely appeals to the public in general during the year 2012, was a very different ideal in 1942. 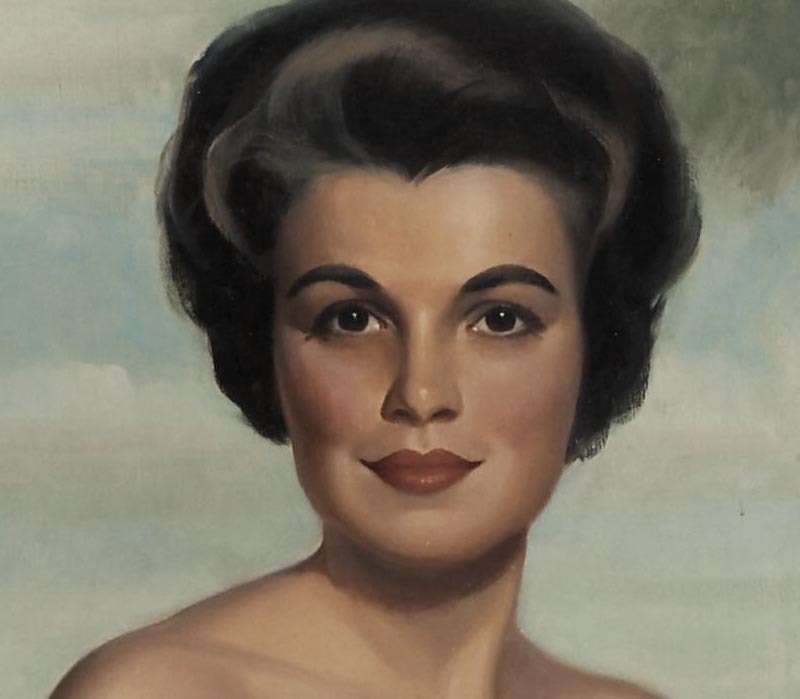 We are fortunate to have had likes of Brad Crandell to record a most unique period in history, when beauty was attractive, appealing, and refreshing. Many thanks to Kent Steine, and Leif for sharing these beautiful illustrations! Beautiful work.The pastel portraits of Bette Davis and Ingrid Bergman are especially good.